Serena Williams has been one of the most dominant players in tennis for well over a decade. Alongside her sister Venus, she's also one of the most well-known players in the WTA. Despite her long time atop of the rankings, more than 50 tournament wins in singles and over 20 doubles championships, Serena Williams cards and memorabilia remain extremely affordable. Some might say undervalued. Over the years, Serena Willliams has appeared in lots of sets, both mainstream and oddball. 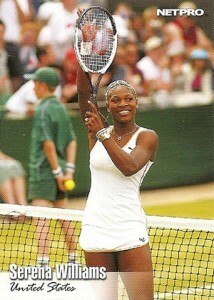 However, most of her cards are cheap, in part due to the lack of mainstream popularity of tennis cards. 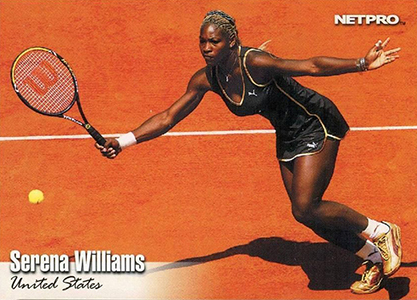 NetPro and Ace Authentic, the major tennis card makers as Williams was establishing her dominance, didn't help matters either with a surplus of sets. Some of these came with massive print runs given tennis' foothold in the hobby. 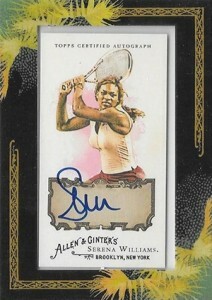 Compared to a lot of her peers, Serena Williams has autographed cards in only a handful of products. This should place a bit of a premium on those autographs that do exist. Below are some highlights of key Serena Williams cards. Click on the links to shop for singles on eBay. 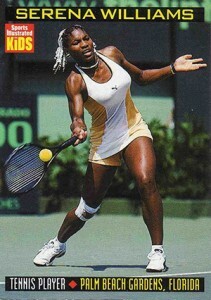 The first Serena Williams card came inserted in a 1999 issue of Sports Illustrated for Kids. Part of a sheet, it comes with perforated edges and is susceptible to damage. Given that it came out about four years before her first traditional card, this one is a bargain. It's also relatively tough to find. 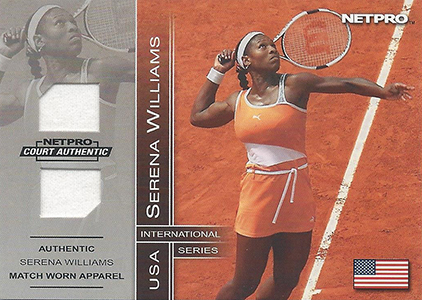 If you're looking for a traditional Serena Williams rookie card, 2003 NetPro Tennis delivered her first pack-inserted card. The horizontal card has a nice action shot. Williams also appears in the short-print portion of the set. This card has her with her racket held high and a smile on her face. And while it's a little tougher to find than the regular card, all 2003 NetPro Tennis cards remain cheap. There's also a glossy card that came in a special factory set. This card was limited to just 5,000 copies. 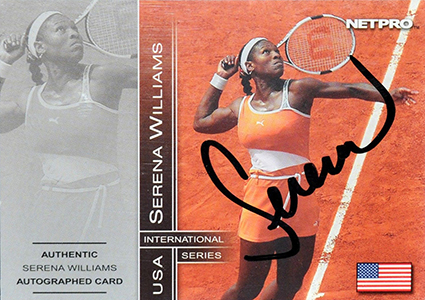 Following the release of 2003 NetPro Tennis, International Series aimed to offer something more upscale with the inclusion of autographs and memorabilia cards. With much of the attention on those parts of the product, base cards are largely overlooked. Serena Williams appears on cards #2 and #82. 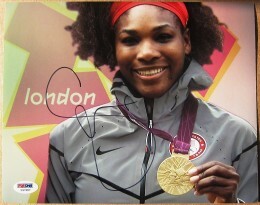 As the first official Serena Williams autograph card, it's easy to understand its popularity. It's also one of very few cards signed by the tennis great. Once Ace Authentic started making cards, the only appeared on a couple of buybacks for the company. Williams also signed for Panini and Topps, but in very limited numbers. The first pack-inserted Serena Williams memorabilia card comes with a dual-window design. Numbered to 500 on the back, these cards can be found with both white and orange swatches. Distributed as a small factory set, 2003 NetPro Elite has a stated print run of 2,000 sets. Each came with 20 base cards and one Glossy parallel limited to 100 copies. Despite the small print run, this card remains extremely affordable. 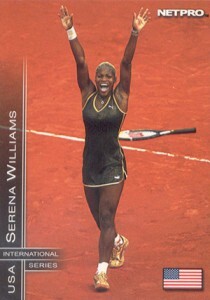 As far as monetary value goes, this is the Serena Williams card to have. Allen & Ginter is wildly popular in baseball, with lots of collectors chasing master sets including all of the autographs. Every year it includes a selection of non-baseball "champions," including Williams in 2008. Besides the regular blue signature, there is a red ink parallel that's numbered to 10. Williams also appeared in the base set and on several different mini parallels. 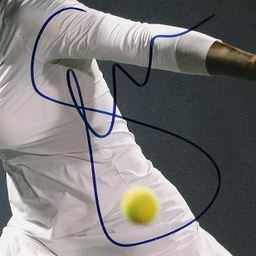 Serena Williams Key Signature Attributes: An authentic Serena Williams signature autograph will exhibit several distinguishing characteristics. 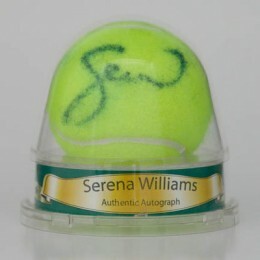 Tennis player's signatures typically vary depending on the item signed. The most significant difference being present on tennis balls which are notoriously difficult to sign as compared to flat items. 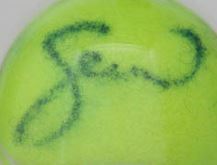 additionally, Serena's signature has varied over time making authentication difficult. Here are some characteristics to look for regardless of the item or time period in which she signed. The "S", regardless of the style written, is over-sized in comparison to the rest of the letters. The first letter "e" is legible and forming a closed loop. More often than not, the last letter "a" includes a flair coming off the end of the letter that resembles a backwards "c."
The last name is usually absent. Dual Signed Venus Serena Williams booklet JSA authentication!